Reading comprehension worksheets don't have to be boring. Several of these worksheets include the same questions as the interactive exercises linked from Reading Strategies and Comprehension Practice, allowing online practice as well as with the worksheets (printable pdfs) here. ESL teachers of intermediate or advanced classes (or even high school or AP English teachers) might find these worksheets useful as a follow up to the reading given. These pdfs are available for individual or class use, but they are copyrighted and may not be sold, posted on another website without permission, or distributed without the copyright notice. Reading comprehension requires several skills: word recognition and decoding skills as well as some familiarity with English sentence structure and the ability to construct meaning from the words set on paper-- to think about what the author is trying to communicate. Good comprehension also requires knowing your purpose for reading, and the abilities to skim, scan headlines, call-out boxes, and other text structure for the information you need, or slow down and analyze dense text in which every word matters. Academic tests and tests like the TOEFL, IELTS, or SAT (as well as the Common Core standards and the needs of the workplace) also look for critical thinking and the ability to make inferences and to recognize the implications of a reading selection. The questions in these worksheets give practice with those skills as well. If you have questions, comments, or suggestions about the worksheets, I’d be happy to hear. Use the Contact me button on the left navigation bar and fill out the short form. You don’t need to leave an email address unless you want an answer. You will need Adobe or another pdf reader to download these pdfs. If you do not have Adobe Reader you can download it, free, here. > Reading Comprehension Test Practice on another TED video: "Where Ideas Come From." > A Comprehension Test on a TED talk on motivation. (It tests either reading-- if students first read the transcript-- or listening/watching.) This is the pdf version of the interactive Comprehension Test page. It's also connected with a Lesson Plan on Motivation. Medical Mysteries is a brief overview of the ways diseases have affected history and the difficult progress people have made in understanding and controlling them. Click the Buy Now button to download Medical Mysteries (Individual Study packet) for $3.75. Pay securely using any major credit card or Paypal. 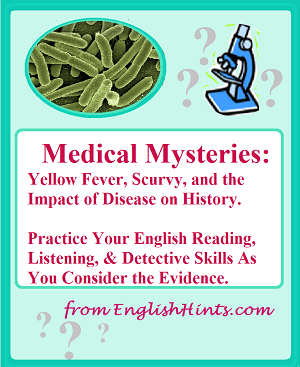 If you're a teacher, check out the original version of Medical Mysteries including lesson plans for a week or more of class investigation. The classroom version includes individual or group webquest suggestions so that students can further investigate the efforts of some of the scientists who helped break the hold of disease: Jenner, Pasteur, Koch, Snow, Salk, and six others. 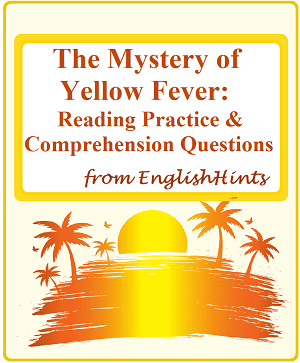 It's on Reading Comprehension Lesson Plans, along with shorter versions for those with less time available. If you don't need the complete Medical Mysteries collection, check out these individual selections taken from it. 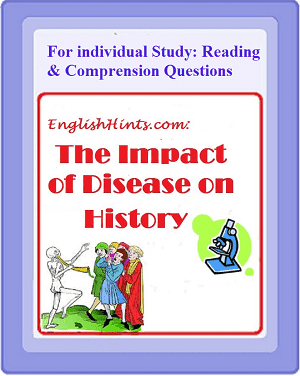 "The Impact of Disease on History" Individual Study packet includes not only the reading selection and questions on the ways killer diseases have affected history, but also the suggested video links and the crossword. Press the "Buy Now" button to download it for $2.50. This is a short individual selection. It's just three pages: a short reading selection and questions, plus the answer sheet. Even though brief, it tells an absorbing story of the heroic efforts that led to the understanding and conquest of yellow fever. That success saved thousands-- maybe millions-- of lives, and made it possible to finish the Panama Canal. Click "Buy Now" to get it for just $1.25. See also the "Words for Success" reading comprehension lesson plan and worksheet packet in Academic Vocabulary Worksheets. It has a two-page reading comprehension worksheet on an outstanding commencement address on the meaning of success, as well as practice with goal-setting and success-related vocabulary. Home> ESL Worksheets> Reading Comprehension Worksheets. 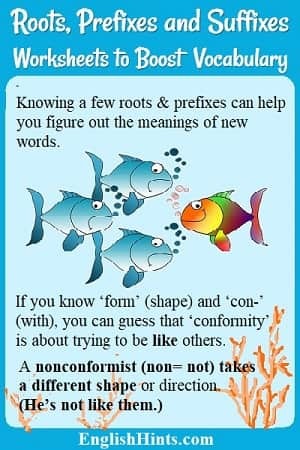 These root, prefix, and suffix worksheets offer simple exercises to help you learn and practice the most important building blocks for English words. 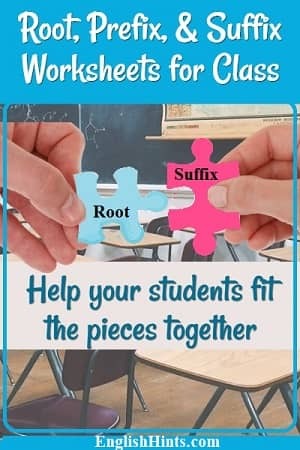 These root, prefix, and suffix worksheets can help students understand and practice root and affix use, including the ways suffixes change word parts of speech and meanings. Do you need Level A2 English listening practice? Try these comprehension questions (and bonus writing or discussion questions) for 3+ TED talks on hope.